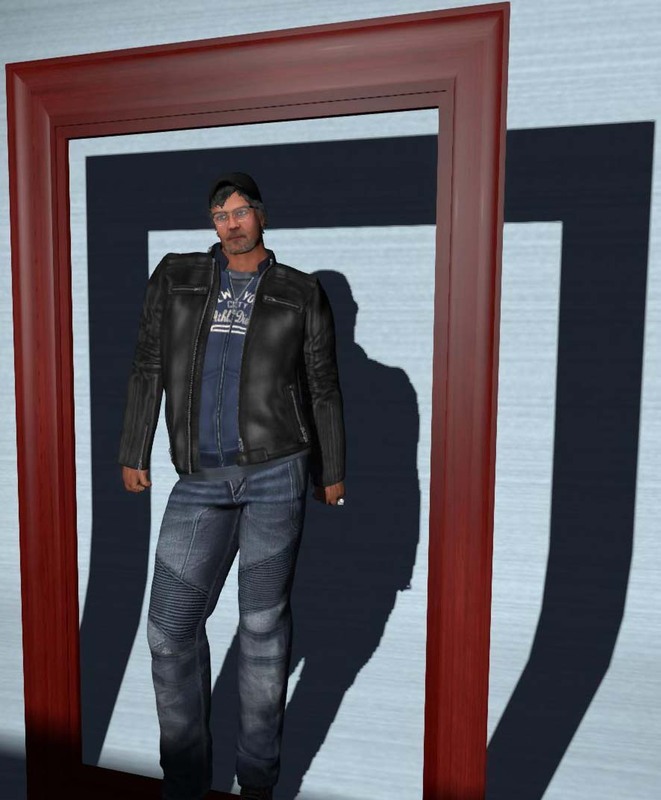 It is really hard to find good casual footwear, like sneakers in SL. I blogged about these before, just before Halloween L&B released the freakshow set of sneakers for a gacha event. I just couldn’t pass up showing them off again. look down at my feet yes there are sneakers. 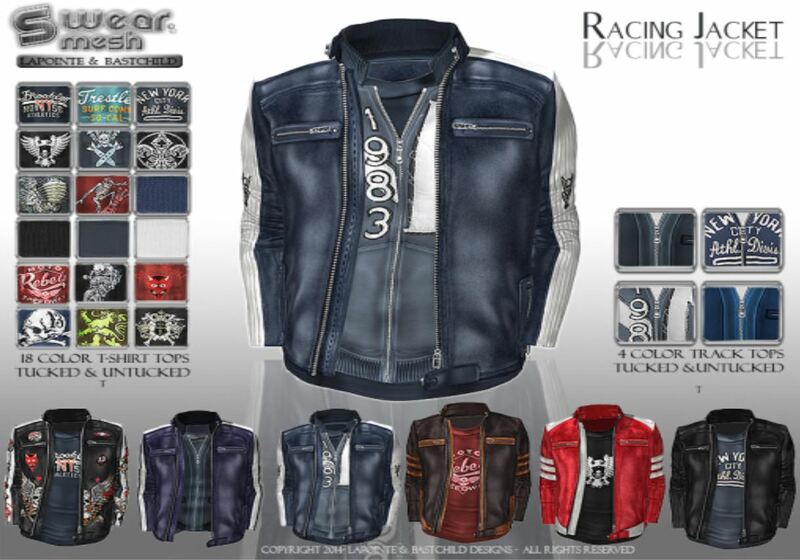 L&B has just released a new leather jacket called “Racing” Leather Jacket Set for men. This is a great work. It lives up very well to the reputation for design and texture detail. This jacket comes in 7 different sizes – yes 7 ranging from XL to XXS. so everyone should be able to find something to fit. There are oh so many options to this jacket. It can be worn just jacket. Racing Jacket no shirt shown with Moto jeans. It can be worn with a t-shirt add-on that is tucked or not and it comes with a Track Top add on that can be worn either tucked or not and over the top of the t-shirt add on. Racing Jacket shown with track jacket add on and moto jeans. The great hud has so many options on it that this can be worn just about anywhere. On the hud there are 6 leather options, 18 t-shirt options, 4 options for the track top, and 2 options for the hardware options. So many options and opportunities here. There are also 2 alpha options, one for the the jacket with the add-ons and one without. Its hard for an avatar of my size to find mesh that will fit properly.and still look good. I tend to go back to the same vendors because i easily know what size i need to and should wear. I have found that the Large size at L&B usually works pretty well for me. I like the slightly snugger fit look. So all in all Great Job. Daddybear highly recommends.